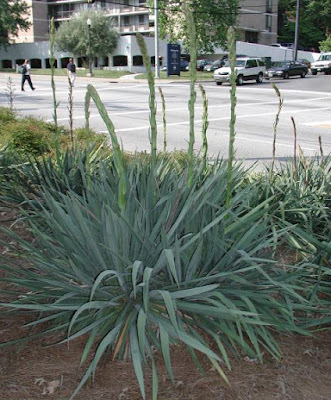 Congrats to any and all of you who identified the mystery organ, er, root, er tuber, as a yucca because if you did, you win a free ebook of your choice! Also, if you were the 5th commenter, and you didn't say yucca, you also get a book (according to random.org). Check out my book list to the left and let me know which one you would like. Please send an email to maddie.james@insightbb.com and I'll shoot the book rightbackatcha! Maddie: Oh! There is some more yucca! I want to take a plant home with me. Karen: You can't. We've been over and over this. Maddie: But just a baby yucca? No one will ever know. Karen: They are endangered. You can't take them across state line. Besides, we're on the reservation. You can't take plants off the reservation. Maddie: Look at all of them! No one is going to miss a baby yucca. Look. Stop. There is one now at the side of the road. Karen: We're not stopping for yucca alongside of the road. Maddie: But we stopped and picked sage alongside the road, on the reservation, when you wanted some. Karen: Just is. Trust me. I was married to an Indian. Maddie, frowning, and failing to see the logic: Oh. So, nevertheless, I never have taken a baby yucca home with me in fear of being nabbed at airport security for harboring concealed tubers and attempting to take them across state line. And congratulations to Karen from Omaha, for knowing her rule book so well! I misspelled it. Does that count against me? Do you know I actually got out of bed to see if I was right? Yeah! Oh, spelling never counts here, Jennifer. Remember, we're "unedited" LOL. What book would you like, sweetie? Have to look and see which ones I already have!